Nelson Pinos: “These 500 days have been very long and difficult … I can tell how awful they feel knowing that their father cannot be with them.” Lucy Gellman Photos. A man sits on a bed, neck bowed as if in silent prayer. One arm falls to his side, the other reaches up to touch his head, comb back a layer of hair. Legs bend at the bed’s too-small edge; the door mirrors his back and shoulders. Around him, the room seems to shrink: worn carpet, low ceiling, a black and white blanket patterned with zebra stripes. In the image below, there's a close up of his ankle monitor. In the time that he has been there, his eldest daughter has taken multiple jobs. His son has turned six. His wife has helped brainstorm a worker-owned business. The seasons have shifted from frigid to blistering, blistering back to cool. And for most of it, he has only seen the world through this room, and the building it is in. 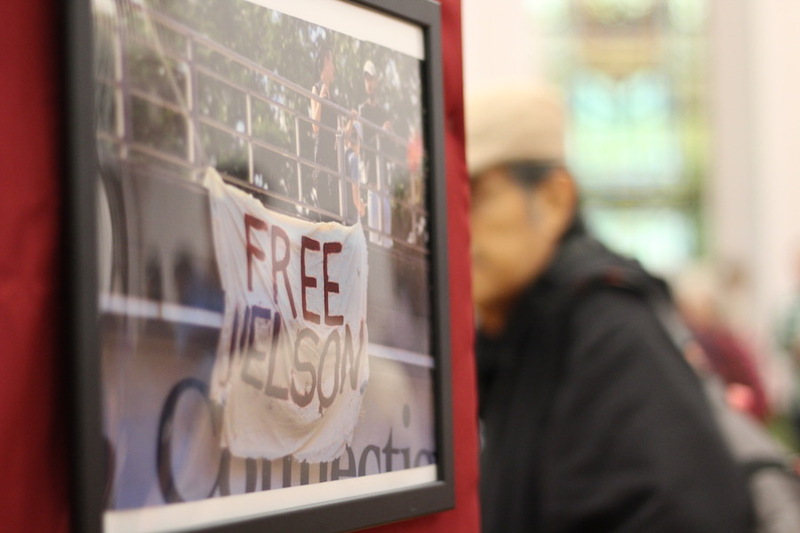 That man is Nelson Pinos, an immigrant who had been seeking sanctuary from Immigrations and Customs Enforcement (ICE) for almost 18 months at First & Summerfield United Methodist Church in downtown New Haven. 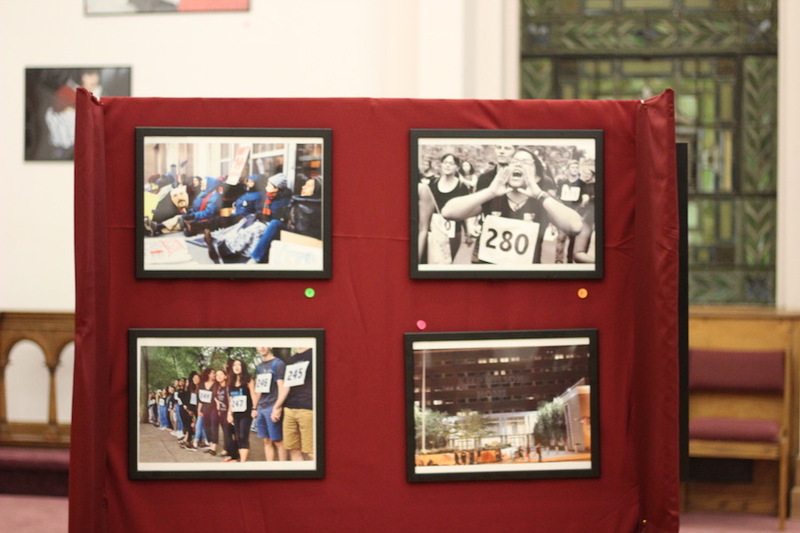 Saturday night, members of Unidad Latina en Acción (ULA), the Connecticut Immigrant Rights Alliance (CIRA), Party for Socialism and Liberation (PSL) and others launched Communities Fighting for Freedom, an exhibition of photographs chronicling the sanctuary movement in Connecticut. Photographs include snapshots of Pinos' wife Elsa and young son Brandon, shown at a rally above. 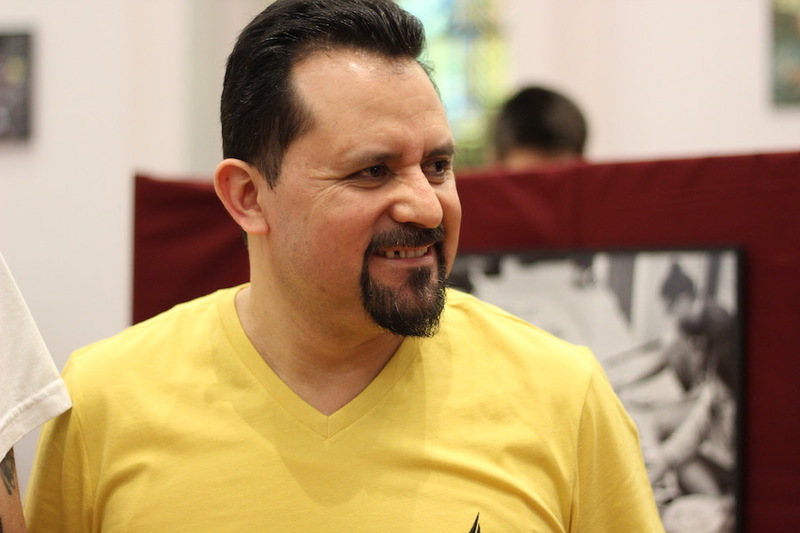 As the exhibition begins, Pinos, his family, and legal team are bracing for the next step in his case: a hearing before the Eighth Circuit Court in Minnesota, scheduled for May 14 of this year. “It is something that has given me hope and motivation to keep fighting,” he said Saturday night. 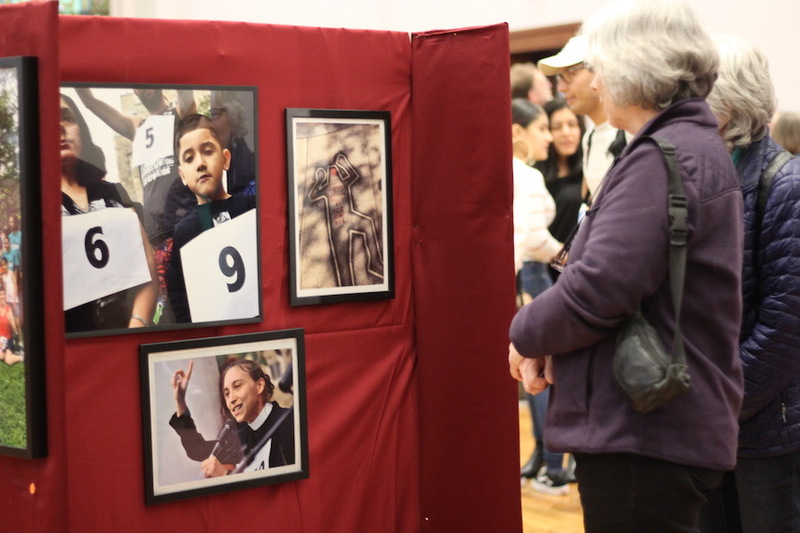 The exhibition, which marks both Pinos’ 500th day in sanctuary and the beginning of Holy Week worldwide, focuses on the cases of Pinos and Sujitno Sajuti, who has been seeking sanctuary at the Unitarian Universalist Church in Meriden since October 2017. After a week at First & Summerfield, the show will be traveling to the Unitarian Universalist Society in Manchester, Conn. and then to the Unitarian Universalist Church in Meriden. 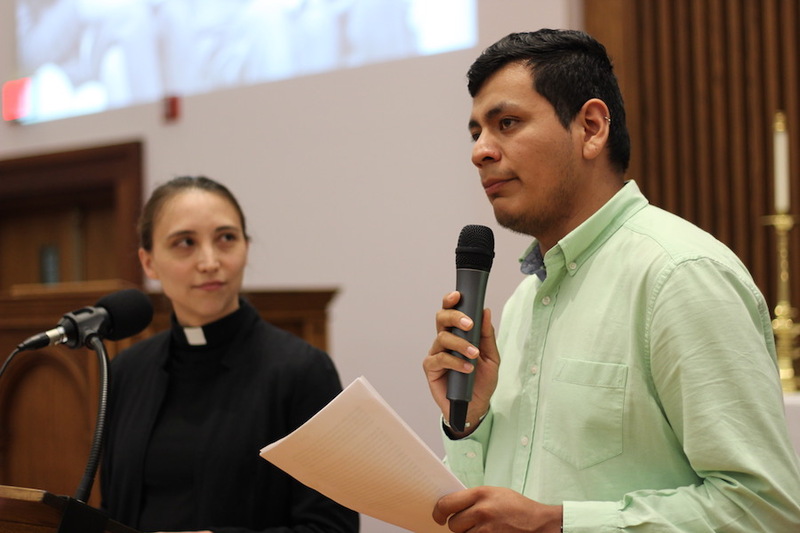 ULA member Jesus Morales Sánchez said that it may also continue on to 10 other sanctuary congregations in the region. Jesus Abraham Morales Sánchez “While the world debates the meaning of sanctuary as a matter of legality and federal immigration policy, we hold onto our original definition ... love." 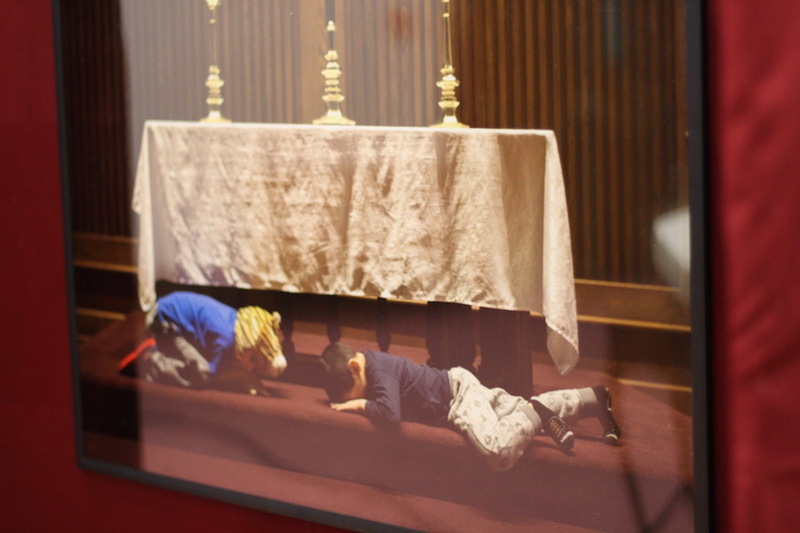 In the show, tens of photographs capture moments in a sanctuary movement that has been steadily growing since Donald Trump’s election in 2016, as Connecticut houses of worship have opened their doors to Nury Chavarria, Marco Reyes, Nelly Cumbicos, Malik Naveed bin Rehman and Zahida Altaf, Pinos and Sajuti. A sprawling kind of activist show-and-tell, they paint sanctuary as a collective movement, underscored by support and community as well as the fire and fury of a high-stakes political fight. In one, Suarez cups her hands around her mouth and leads a rallying cry on Pinos’ 281st day in sanctuary last September, as activists and students filled the streets downtown on a warm Friday afternoon. In another, Wilbur Cross students congregate on the sidewalks in East Rock, halfway through a walkout in support of Pinos’ case. In yet another, Pinos’ daughters Kelly and Arlly lock arms at a rally in Hartford, just before Kelly reads a letter she’s written to Hartford ICE Director Aldean Beaumont. Several mark milestones in Pinos’ life: his first Christmas in sanctuary and then his second, visits from artist-activists last year, a rally and action in Hartford on the one-year anniversary of his stay. But the most moving portraits in Communities Fighting for Freedom show Pinos and Sajuti with their families, trying to live in conditions that do not allow them to step foot outside. In one particularly striking image, Pinos cracks a huge grin as his son Brandon crawls onto his back for a ride. For a moment, life doesn't just look totally normal: it also looks a little magical too. In another, Brandon is playing with another young kid inside the church, giggling as he transforms into half-boy, half-tiger. It is afternoon or night: the lights are low as they climb over the carpet. Holy, glinting gold rises from the table above them. It's a strange sanctuary playground, alien to most small children. And stranger yet, it holds their little, laughing bodies in a way that is right on time and overwhelmingly sad. On a panel just a few feet away, Sajuti and his wife Dahlia (pictured above) are frozen in greyscale, laughing at something that has been said outside the frame. The longer one looks, the harder the feelings hit: crushing love, yes, but also palpable sadness and fatigue, anger and frustration. Pastor Vicki Flippin, who met Pinos when she stepped in to lead First & Summerfield last summer, tied the exhibition’s opening to Holy Week, which began worldwide with Palm Sunday and ends with Easter on April 21. 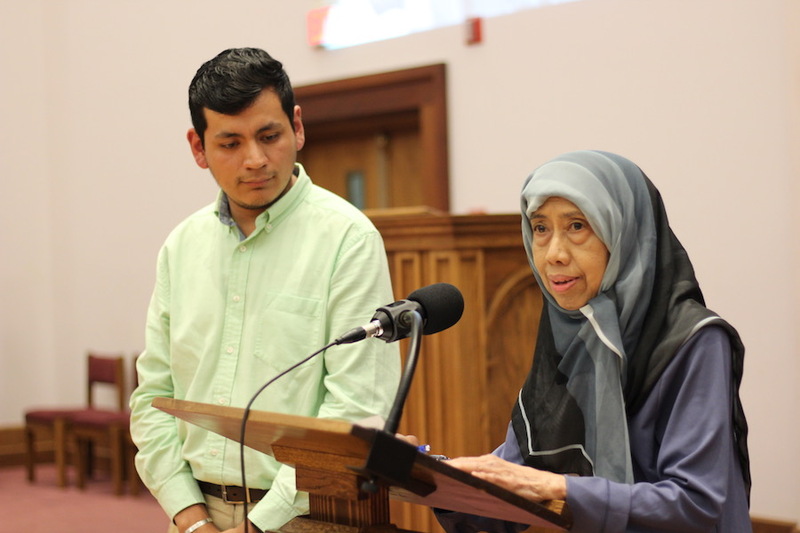 She told attendees that each year, Jesus’ wrongful conviction and brutal murder—"the unjust state that surrounded Jesus,” and included mass surveillance and corrupt government—weigh heavy on her mind. But this year, she has also drawn parallels between the Jesus who walked Nazareth and the undocumented immigrants who flee oppressive governments in their home countries only to encounter them where they are seeking asylum. “But here’s the thing,” she added. Every year, when she and her congregation reach the end of Holy Week, they get a story of resurrection. In the biblical sense, that means Jesus rises, and the congregation can celebrate the miracle of Easter. In her day-to-day world, that means something else. 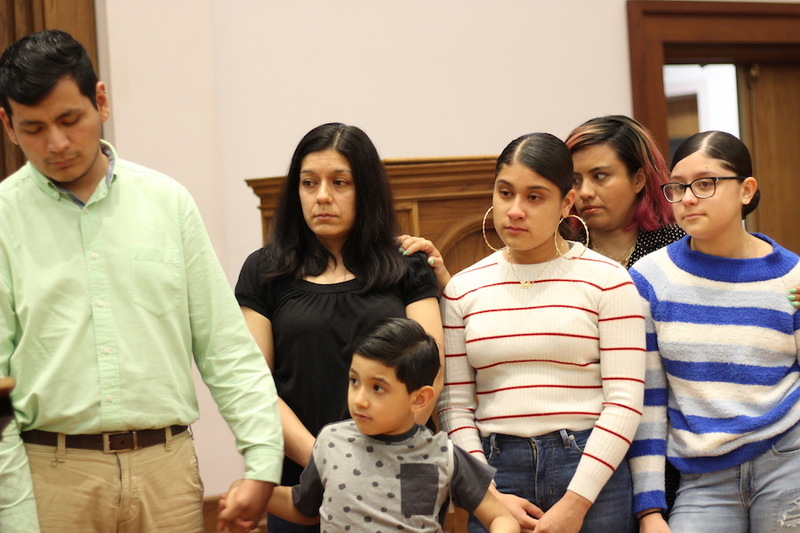 In the past months, she has “really gotten my hopes up” that there will be a breakthrough in Pinos’ case, and he will be able to go home to his family. So many times, she told attendees, she has thought that at last, Pinos will be able to cross the street and not be afraid to keep going. That he will win the stay of deportation for which he, his family and his lawyers have been fighting for almost a year and a half. 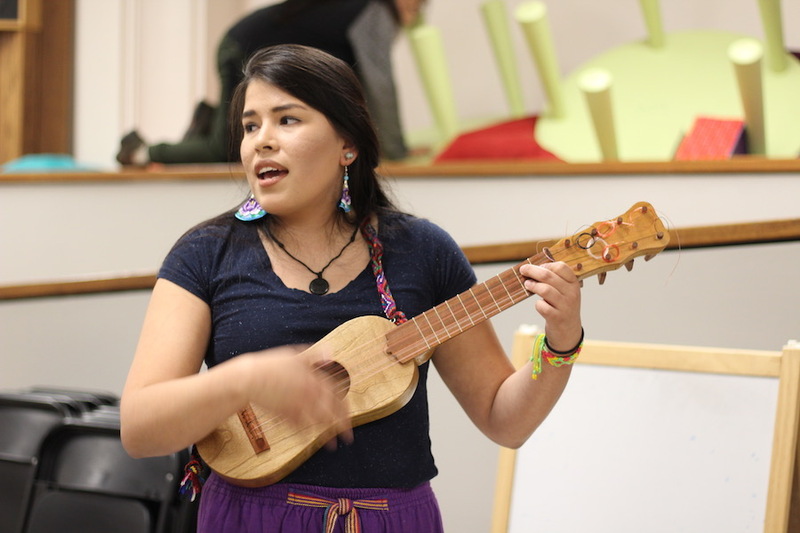 The evening also included music from Suarez and her band and a communal meal. To watch more from the opening, click on the Facebook Live video above. To see the exhibition Communities Fighting for Freedom, contact First & Summerfield for hours.